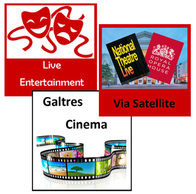 Cinema tickets are usually £5 for adults and £3 for 16yrs and under. Other event prices vary so please check with the Box Office. For some live and broadcast events the finish times may be estimated, these can be confirmed when booking. ​You can book tickets in person or by telephone. ​Details of our events are also posted on our Facebook Page. We also have our own resident theatre group, visit the Easingwold Players website to find out ﻿mo﻿re.